N'tho 'Sraom is a Special Operations Sangheili of the Fleet of Retribution's Special Warfare Group. During the Great Schism, he assisted the fleet in their war against the Prophet of Truth and the Jiralhanae. 'Sraom was born into the Sraom lineage, and lived in the state of Sraom. He is a fairly typical young male adult Sangheili, he began compulsory military service at the end of adolescence, and remains unmarried with no close, non-familial relationships outside of his martial order. His zeal and innate talent for both strategy and leadership put him on an accelerated promotion path. During a battle in the 2540s, N'tho engaged a human soldier by the name of Frank Kodiak, after cutting his arm off with his energy sword, N'tho would have killed Kodiak were it not for a nearby explosion that caught the Elite off guard, giving Kodiak a chance to escape. On November 3, 2552, the remaining Hierarchs of the Covenant denounced the Sangheili and ordered the massacre of the Sangheili High Councilors. With this revelation, N'tho joined forces with Arbiter Thel 'Vadam and Special Operations Commander Rtas 'Vadum. 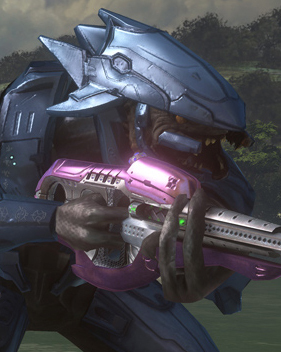 N'tho served in the Sangheili's Fleet of Retribution, under the Special Warfare Group in Special operations. While 'Vadum sought to destroy the Flood's presence on Installation 05 with most of the fleet, N'tho traveled to Earth with the Arbiter, Usze 'Taham, UNSC Commander Miranda Keyes, and Sergeant Major Avery Johnson. On November 17, 2552, the Forerunner Dreadnought activated the Portal at Voi. Soon after, the Fleet of Retribution traveled through the portal and arrived at Installation 00 where they started their naval attack on Covenant Loyalist ships. N'tho was sent to the surface with a squad of Sangheili soldiers commanded by Thel 'Vadam to assist UNSC forces with deactivating the three shield generators protecting the Citadel. N'tho and the rest of the squad succeeded in deactivating one of the generators while John-117 deactivated another, however the UNSC forces in the third generator were overrun and were forced to retreat. N'tho left the generator building with the squad and linked up with the other UNSC forces and they managed to deactivate the final generator, causing a section of the shield to fall. N'tho and the rest of the UNSC and Sangheili forces fought their way to the Citadel and eventually reached the light bridge leading to the entrance. 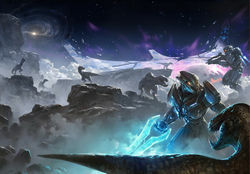 N'tho, accompanied by the Arbiter, John-117 and a few Marines and Sangheili fought their way through the Citadel, allowing John-117 to deactivate the Halo Array and the Arbiter to kill the Prophet of Truth. Following the end of the Human-Covenant War N'tho became an assistant to the Arbiter, and actively participates in missions under his command. In 2555, N'tho received word from the Arbiter that he was organizing a team to travel to the Ark by request of the UNSC after human scientists found a countdown to the activation of the Halo Array on Installation 07. The Arbiter ordered N'tho to get a shuttle ready for the arrival of Usze 'Taham, who would be joining him on the mission, and to bring the Huragok Drifts Randomly with them. N'tho fighting morolaath alongside Frank Kodiak on Installation 00 during Operation: FAR STORM. After taking the shuttle up to the corvette Mayhem the Sangheili traveled to Earth. Upon arriving, they descended in a Phantom onto an airfield near the deactivated portal in Kenya, Africa. N'tho along with his aide Usze 'Taham and the Huragok Drifts Randomly were there to greet the humans that were waiting for them. They soon proceeded to Research Center Alpha where the Huragok began its work on reactivating the portal. Two days after their arrival, N'tho went outside near a tree to practice with his energy sword, he was approached by Spartan Frank Kodiak who requested they do some sparring together. N'tho agreed but soon found out Kodiak wasn't there to spar, he was there to fight him. After asking why he was fighting him, Kodiak reminded him he had cut off his arm in the war. Kodiak however decided he shouldn't kill him as it would be in violation of the mission. At that moment, Drifts Randomly activated the portal, causing an earthquake that made the tree N'tho was standing next to fall on him. Kodiak decided to spare his life and cut the tree with his sword, allowing N'tho to escape. They looked up to see a Forerunner Retriever exit the portal and start excavating near the portal but it was soon destroyed by the UNSC Cruiser Endeavor. A meeting was then organized on Mayhem's bridge, as per N'tho's request. N'tho suggested entering the portal immediately but Captain Annabelle Richards insisted they wait for consent from her superiors. Not wanting to waste any time, N'tho ordered his crew to fly Mayhem into the portal but before they could enter, another Retriever appeared. Mayhem quickly took care of the sentinel and then entered the portal. Instead of taking weeks, Mayhem arrived at the Ark in a matter of hours. The vessel was soon engaged by multiple armed Retrievers and was overwhelmed. The corvette crashed onto the surface of the Ark, suffering severe damage. N'tho and the rest of the expedition exited the ship, and he informed them of where they were heading. After a while the group were attacked by a pack of Blind wolves and a group of Chaefka. During the fight Olympia Vale was attacked by one of the animals and her mind started to be controlled by an unknown force which made her walk away with one of the Chaefka. After learning of her disappearance, the remaining members of the expedition were split up, with one team consisting of N'tho, Luther Mann, Spartan Kodiak, Zon 'Vadum and Kola 'Baoth tasked with heading straight to the Citadel and the other team consisting of Usze 'Taham, Spartan Elias Holt and Henry Lamb tasked with searching for Vale. N'tho lead his group and found a mammoth-like creature which, to their surprise, carried them straight to the Citadel. Both teams arrived at the Citadel and the hard light bridge leading to the entrance was activated for them, which made them suspect a trap. N'tho told Luther Mann of his experiences of the battle that happened in and around the Citadel, and that it was one of the best days of his life. The group made their way through the building and across the bridge leading to the control panel that would deactivate the array. Upon reaching it Luther Mann deactivated the array and dozens of Armigers teleported in front of them. The team fought their way back across the bridge but N'tho, Kodiak, Holt and Zon were cut off from the rest and were teleported into a dark corridor. They made their way through and found a room with Olympia Vale and the Ark's monitor inside, but couldn't enter due to an energy barrier. Vale was then attacked by a cyborg created from Kodiak's brother Bobby and a fight between the two ensued. N'tho, Zon, Kodiak and Holt went and found the monitor's data stores and started firing at them, causing the energy barrier to fall. Vale took down Bobby and the monitor begged them to stop damaging his data stores and that he would call back the retrievers if they did so. They agreed to stop shooting, but the monitor attacked them again. This time, Bobby lunged at the monitor and pierced it with his bladed forearm, but he was killed when the monitor exploded, much to Frank Kodiak's dismay. N'tho and the other Sangheili then found a way to the surface and the team headed back to the ship. Not long after, several UNSC ships exited slipspace above the Ark. UNSC Witness soon found Mayhem and brought it and everyone back to Earth. N'tho offered his condolences to Kodiak for his loss and apologized for maiming him during the war, recognizing the anger Kodiak must've felt at the action despite the fact that Sangheili wear their battle scars with pride. Kodiak forgave N'tho and the two thanked each other for saving the other's life. N'tho offered to arrange for Kodiak to visit Sanghelios sometime, but Kodiak politely refused. Although N'tho 'Sraom's romanticized nationalism is emblematic of all Sangheili, he has developed a healthy respect for humanity, not for their physical abilities or martial prowess, but for their audacity and resolve. Although N'tho appears to be equipped with a regular Sangheili combat harness as opposed to the standard Assault harness given to all Special Operations operators, he is still considered a member of the Special Operations unit. Given of the color of his armor, it could be inferred that he only recently joined the Special Operations unit, particularly considering he is the youngest member of the group. After becoming a Shipmaster, he began wearing a crimson, yellow, and ivory combat harness similar to the one worn by Usze 'Taham and wielded an energy sword of a more rugged and vintage design. N'tho 'Sraom is a playable character in Halo 3 as the third player character over either Xbox Live or System Link and Campaign Co-op mode. The character's name first appears in the Bungie.net article describing the Brute Chopper, even before the announcement of four-player co-operative play, though then he was called 'N'thro 'Sraom. N'tho has apparently been a vital source of information for the UNSC, detailing Jiralhanae rank structure and, in particular, the specific role the Choppers play within the Jiralhanae ranks. When he activates his flashlight, the light is simply projected with no point of origin, as no visible flashlight is on his shoulder. This also applies to the fourth player's character, Usze 'Taham. Both N'tho 'Sraom and Usze 'Taham have their leg holstered weapons appear backwards. This is most apparent with the Needler, with the side that has the protruding needles opposite the direction of other Elite models. Occasionally, N'tho 'Sraom will spawn without a helmet. A portrait view of N'tho 'Sraom in Halo 3. From the left, Usze 'Taham, Thel 'Vadam, John-117 and N'tho 'Sraom in Halo 3. 'Sraom and his comrades on the offensive. N'tho using a plasma cannon. 'Taham (right), along with 'Sraom (left). An internal system glitch causing 'Sraom to spawn without a helmet.